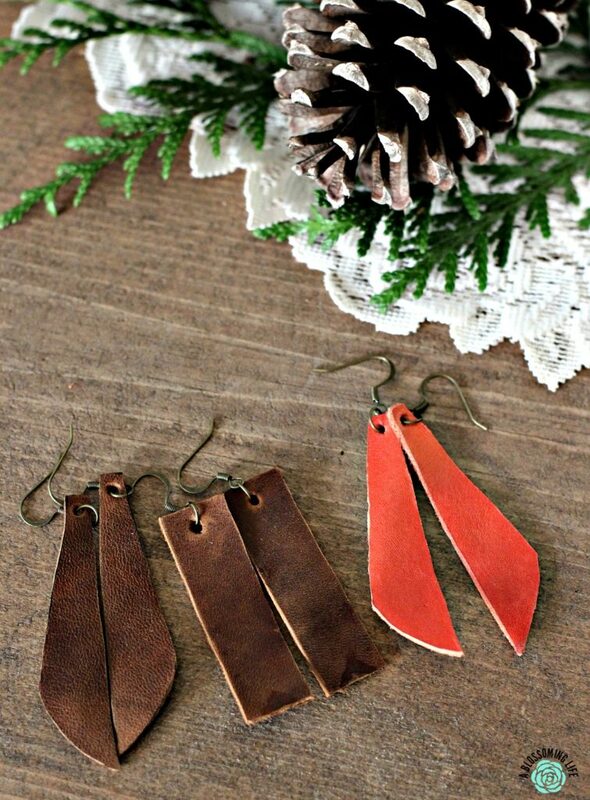 These simple DIY Leather earrings are the perfect and inexpensive gift. Learn how to make these stylish DIY leather earrings without a fancy machine. 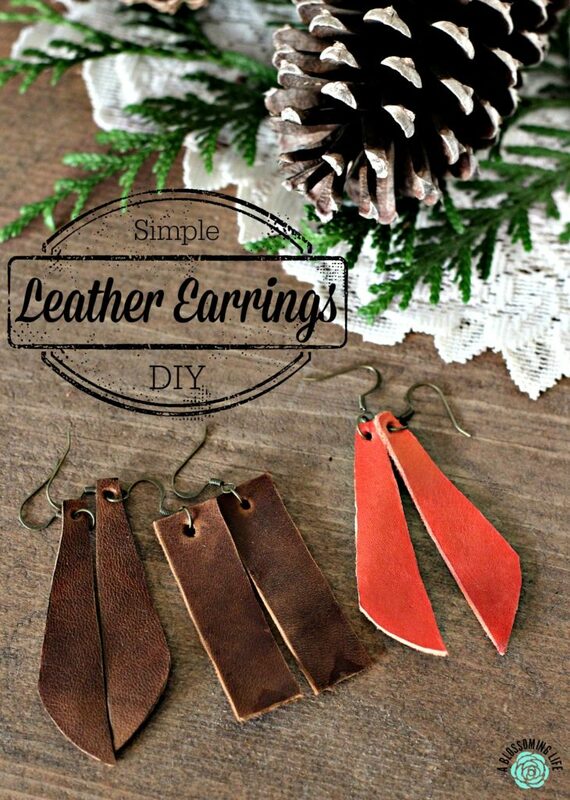 Follow my tips below to make these leather earrings even more creative. Items you may need: leather, razor, pencil, leather hole punch, earring hooks and loops, and other optional ideas (see below). Give it up for this awesome Christmas gift idea. DIY leather earrings always win. So stylish and on trend. And super inexpensive. These are my go-to earrings. I wear them just about every day and always get compliments on them. For Christmas this year, I gave them to all of my favorite women. Between Joanna Gaines’s great fashion style (she is always rocking some leather earrings) and the shift in fashion towards minimalism and nature, leather earrings are in. My friend, Naomi, and I arranged a craft night at her house with a quick trip to Hobby Lobby for supplies. We had these DIY leather earrings in mind, but they turned out even better than we expected! I’ve made several pairs for Christmas gifts, and I wear mine with just about everything. You have plenty of time before Christmas, so get to work! Libby actually wrote this article last year at this time. It was our first Christmas since moving and she so kindly made me a pair of these earrings and shipped them to me. Unfortunatly, they got lost in the mail, or so I thought, and she ended up making me another pair and sending them once more. Two months later, I found the first pair still tucked into the envelope hiding between my seats in the car. Oops. 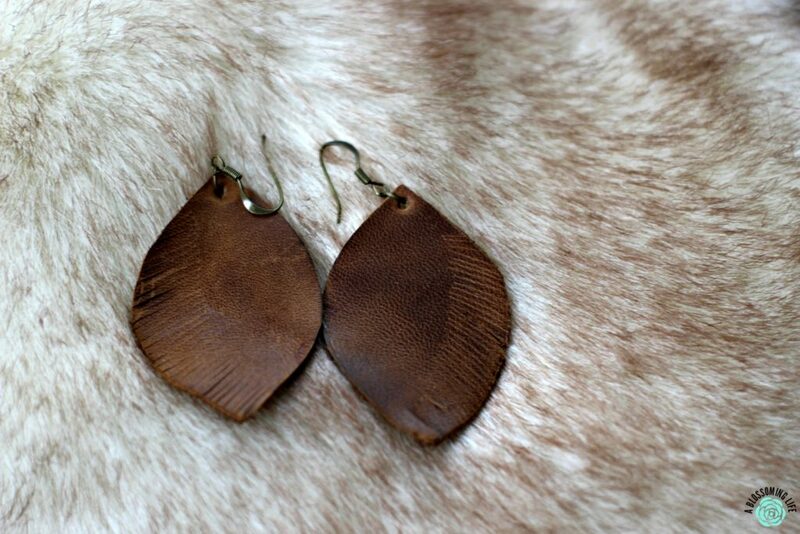 The good news is that I now have two pairs of these DIY leather earrings, one sage green pair and one brown pair. I wear one of the pairs every day. Use scrap leather to save some money. 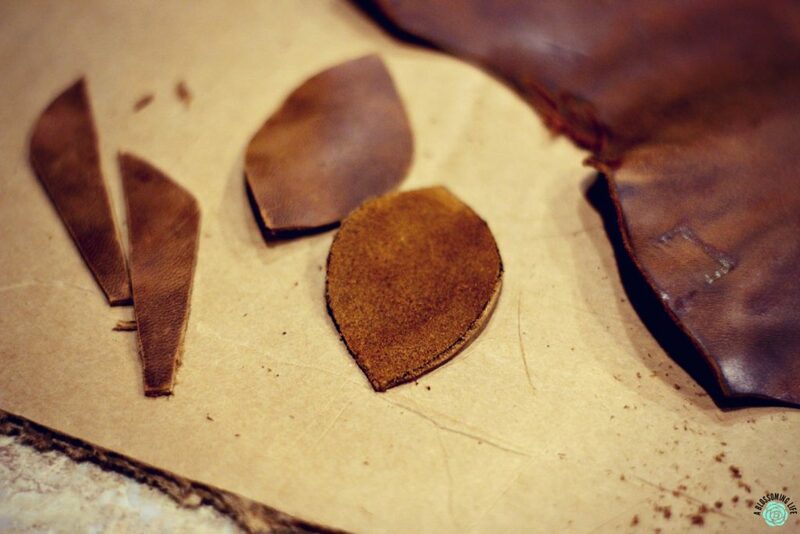 Pick leather that is flatter, smoother, and is also thicker and harder. Vary the color for more fun. Layer the leather to add more visual interest. Hit up your local craft store for materials. They have different styles and colors. Trace a design you would like on a piece of paper and cut out the pattern. 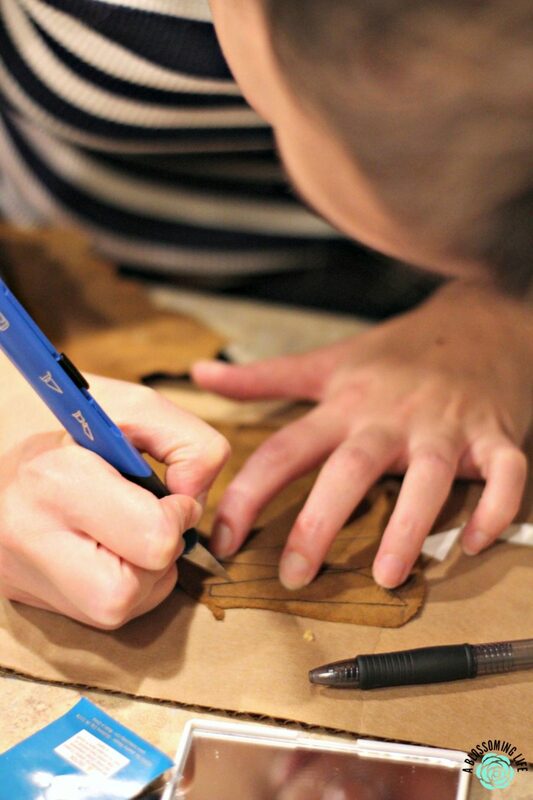 Use a sharp pencil to lightly etch the pattern onto your leather. We started with a pen, which gave us a little trouble when removing the ink (we scraped it off with the blade). Carefully cut your leather with the razor blade on a surface that you won’t ruin. We used thick cardboard. On a very hard surface that might survive damage, punch out a hole in the top of the earring and attach your earring fittings. Need more DIY Ideas? Check these out! These Wood Wick Candles are amazing. I’ve been wearing my first pair for a year now, and they’re holding up great. Keep them away from water or moisture of any kind unless you seal them, as moisture will darken the leather. Leather is pretty unique, so put it to work for you! Leave it plain or jazz it up with these ideas. Get creative with the shapes you cut them. Add some fringe by slicing little slits into the leather. Dip them in gold paint. In the photo of the long, rectangular, brown earrings, I even cut them so that a natural mark in the leather would be positioned at the bottom middle for a touch of character. 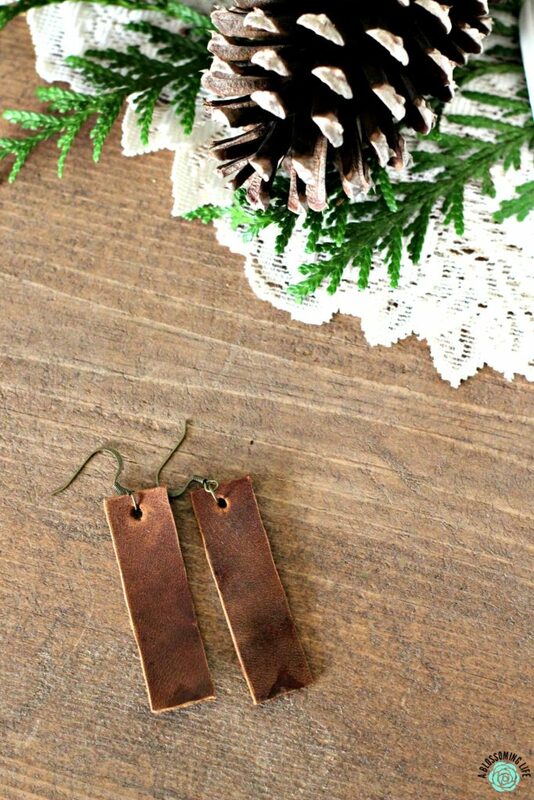 Complete with some quality gift wrap, these DIY leather earrings are the perfect Christmas gift. 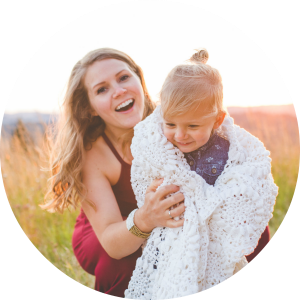 Fashionable, thoughtful, inexpensive, and super versatile – these make awesome gifts! Where can I buy leather? I bought the leather from Hobby Lobby, but I’m sure you can find them online, or at other craft stores like Michael’s or Joann’s. Do I have to use a Cricut? No. We made these by hand so you definitely don’t need extra fancy equipment. But you can also use one if you have it. What is the best leather for earrings? Find leather at your local craft store (Hobby Lobby, Joanns, Etsy, etc.). For leather earrings it is good to find leather that is flatter, smoother, and is also thicker. Have you ever tried making earrings before?